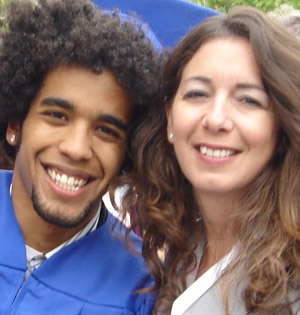 MOTHER AND SON: UrbanFaith’s Christine Scheller with her late son, Gabe. Would it surprise you to learn that when I describe myself as a pro-lifer, I don’t think it particularly matters what I believe about the legality of abortion? Well, it’s true. In my two opinion posts on the Patient Protection and Affordable Care Act, I argued from a pro-life perspective, but the legal battle over abortion is not a priority for me. I believe I have the right to wear the pro-life label, no matter what my position is on the legal issues, because I walked the talk as a nineteen-year-old and because I consistently advocate a life-affirming message. Perhaps it’s battle fatigue. Like many others, I’m tired of the culture wars and the way they’ve turned friends and family members off to the gospel. Some of the people I love most in this world have either had abortions or have participated in abortion decisions and I increasingly don’t want to be associated with rhetoric that hurts them. Conversely, I hope they don’t want to be associated with unkind, unfair, and untrue rhetoric that hurts me. I know the legal fight is important, but it’s not one I’ve engaged in other than as a writer (occasionally) and a voter. I’ve never protested at an abortion clinic, attended the annual March for Life in Washington D.C., or volunteered at a crisis pregnancy center. I have taught a life skills class to teen moms at an alternative public school though. What it means for me to be a pro-lifer now is to be an advocate for a comprehensive ethic of life, one that spans from womb to tomb, from conception to natural death. It includes issues like healthcare and immigration reform, extreme poverty, euthanasia, and more. Ever since my son died by suicide, my first pro-life priority has been suicide prevention. That’s why I was so glad to read that Tony Cornelius, the son of the late Soul Train founder and host Don Cornelius, has launched a suicide prevention foundation in memory of his father. “This is a huge, huge issue and it’s an issue that has a veil of shame over it. People are still very uncomfortable with who’s talking about suicide,” Cornelius told EURweb. “Breast cancer at one time was something that was under the table. Women didn’t want to discuss it. AIDS was something that was under the table. No one wanted to discuss it. I mean I think this is an opportunity to bring this to the surface.” That’s a pro-life message, if ever I heard one. In an email exchange with Religion News Service reporter David Gibson, Russell D. Moore, dean of theology at the Southern Baptist Theological Seminary, argued that “we ought not to let the term ‘pro-life’ become so elastic as to lose all meaning.” He charged that “in most cases, the expansion of ‘pro-life’ is a way to divert attention from the question of personhood and human rights.” I disagree. Just as the gospel message speaks to all of life, so too a pro-life ethic can and should be all-encompassing. I like the way you think, Christine. terrific! I applaud you younger Christians who reflect with true pastoral sensitivity, which I believe was true of Jesus and the apostles — at least those who wrote the NT. Far too much of American Christianity is fear wrapped up in a flag and Bible verses. Thank you for sharing. God’s peace be with you. I agree with Russell D. Moore. Let’s not play with the real issue here. We’re talking about the shedding of the most innocent blood short only of Christ’s blood. Judgment comes upon a nation that continues in the practice of killing the most innocent. I do agree that there are other real problems and concerns that need to be ministered to (ex: the poor, the fatherless, the homeless just to name a few), but don’t water down the issue by pointing to other “pro-life” issues. At least the homeless, the poor, and the fatherless are walking the Earth and still have hope. The child in the womb’s hope is snuffed out before they can even speak for themselves! All sin is sin in the sight of God but there are degrees of sin. It is one thing to ignore the needs of the least among us and this is bad. But it’s a much greater thing to take the life of the innocent because the child is an inconvenient reminder to me of the sin that brought him/her here in the first place. To point this out is not for the purpose of injuring or bringing condemnation. What it does bring is conviction which leads to repentance. As a result, God’s grace breaks forth which then brings forgiveness, healing and peace with God. Thanks Christine for the article. I am also pro-life from the womb to the tomb. I don’t believe that the expanding of the term ‘pro-life’ diminishes the fight to stop abortions but it does expose the very real life and death issues faced by children and adults in our inner cities and beyond. I don’t fault many who wish to retain the restrictive definition of ‘pro-life’–that’s their preference. My understanding of ‘pro-life’ has space for more than just the murder of the unborn–it must include the murder of those who were born and walk among us. Amen! Christians have ALWAYS been Pro-Life! Thanks for this, Christine. Your thoughtful approach to difficult issues is always so refreshing. I appreciate your words here.